Global sensor and machine vision technology company SICK has launched a new LIDAR traffic monitoring and warning system which it says sets a new a benchmark for all-weather traffic control in all climate zones, day or night. The SICK TIC502 incorporates vehicle speed detection with 3D profiling and counting of fast lane, free flowing and static traffic to facilities real-time management and electronic toll charge assessment of all vehicle types according to standard international transport classifications. SICK says it is likely to be welcomed by highways toll and management operators as well as by original equipment manufacturers and integrators of traffic monitoring systems. Neil Sandhu, SICK’s National Product Manager for Imaging, Measurement, Ranging and Systems, said, “The TIC502 generates 3D profiles and combines comprehensive and highly reliable data and warnings with excellent availability in all weather and all seasons. 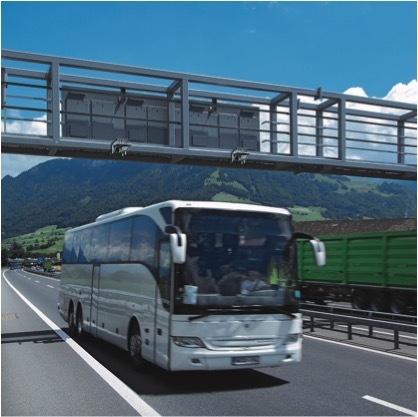 The unit can also be easily retrofitted on structures such as overhead gantries, bridges or tunnel entrances to upgrade existing traffic monitoring and control. The SICK TIC502 LiDAR system comprises twin LiDAR sensors on an angled baseplate for direct, over lane mounting and a TIC Traffic Controller for installation in the highway control room. The TIC502 Master LiDAR unit can be paired with the TIC502 Slave 2D LiDAR unit for axle counting duties using the same Traffic Controller; up to four lanes can be monitored by one controller. Based on infra-red Class 1 (eye-safe) LiDAR sensors, the TIC502 scans vehicles at up to 100 times a second to generate a 3D profile of each vehicle and assesses vehicle class according to TLS8+1, TLS5+1, TLS2+1 or Swiss10, into up to 30 different classes. The live 3D view of traffic is integrated into one, easy-to-use display, and is autocalibrated with moving traffic. The SICK TIC502 has a range of up to 40 metres and a minimum mounting height of 1.5 metres above the tallest vehicle. Vehicle counting accuracy is better than 99%, including vehicles with trailers, vehicle class assignment better than 98% and speed assessment accuracy is +/- 3kph up to 100kph, and +/- 3% above 100kph. With modular software and a web-based configuration and user interface, the TIC502 is easy to set up and operate, with the custom-designed installation wizard. No additional software is required for visualisation of vehicle data, and the Traffic Controller automatically stores a data history of the last 50 vehicles detected; data is directly sent to storage in the customer’s system via FTP or UNC transmission. In addition to its own data collection, the TIC502 data can be used as a trigger for DSRC (dedicated short-range radio communications) and ANPR (automatic number plate recognition) cameras, and so can be integrated with a number of different traffic management systems. The SICK TIC502 uses the SICK LMS 511 LiDAR sensors which are IP67 rated, and operates across a temperature range of -40°C to +60°C, through rain, fog, snow or darkness; the units can be heated to combat icing and condensation. Remote access allows easy maintenance, and as the Traffic Controller stores data independently, it can also be used for temporary traffic data collection, such as with road lane closures and speed restrictions.